The last couple of months have been kinda tough. Not busy, non-stop deadlines tough. Not bad things happening tough. Just tough. You know that sort of day, week, month? In many ways, I’ve been coasting. Life should be easy. No more new releases since meeting three book deadlines in a row in June and July. And no story words. No writing at all, apart from journaling. I could treat it as a vacation from work, some much needed rest. Time to focus on my marriage and my home, often neglected in the rush to meet book deadlines. Time to make space for more worship, more quiet time with God. Time to take better care of myself, to make lifestyle changes to live in a simpler, healthier, more balanced way. Working on all that non-book stuff does feel good. In so many ways, I needed this unproductive, fallow time. The same as God told the Israelites to allow the ground to rest every seven years, and plant no crops, so the break gives the soil a chance to become more fertile for the following six years of farming. More than that, the break from working the fields gave the people a chance to renew their trust that He would provide, as He did in the desert. He’s used this time to bring me nearer Him and to bless me in surprising and unexpected ways. My home and marriage are both better for giving them more time, too. But… but… no story words! For twelve whole weeks now. It feels a lifetime! I can play around making book covers. I can edit chapters I’ve already written for old unfinished stories. I can crit friends’ work. I just can’t seem to produce new words. It’s like that part of my brain is switched off. And I really really REALLY want to be writing! I may need to drop all my solo book release plans for now. But I can’t drop the multi-author projects I’ve committed to. Those books have to happen! Besides – so many book ideas! So many characters and stories flashing around my brain, like fireflies trapped in a jar, wanting to be free. But I just can’t unscrew that lid. It’s too tight. I’m not sure why the word drought. Could be, I simply needed a rest. Could be, it’s something to do with a flare-up in the right-sided brain changes this pesky illness has caused (hope not!). Or it could be, God wanted me to have some time out to focus on what really matters most. He’s been teaching me a lot, this last couple of months. How to REALLY love my husband despite the challenges, and treasure my marriage and our home. How things work better when I follow His leading instead of doing what I want to do. And just recently, how to be content in all circumstances. Okay, so God still has some work to do on that one yet! But I’m getting better at seeing the rainbow, not just the storm clouds. Like the girl in the picture, who could get sulky because the clouds and rain have ruined her day at the beach. Instead, she’s all “Wow, wet sand!” So much wonderful, glorious, squidgy sand to play in! And when she looks up, she’ll see the rainbow, the one I missed when I first chose the photo. It’s subtle. It’s not a big bright right-across-the-sky make-a-wish sort of rainbow. But it’s there. A reminder that God keeps His promises. Always has. And He always will, in His perfect timing. This word drought will end. My story words will get written when they need to get written. And in the meantime, I’m listening to His nudge to write another devotional. I didn’t exactly plan to write the first one, Lessons from Pollyanna: Using her Glad Game to grow spiritually and have more joy in your life! After that one published, when He started reminding me He wants me doing more like that, I did plan to write a companion devotional, focusing on another well-loved children’s classic. Sometime. When the next six or seven or maybe seventeen romances were done. Nope. Not gonna happen. Not those romances, and not that devo, either. Not yet, anyway! Because God knows way better than I do what I need, He’s surprised me with a whole new assignment. LOL, and just now, a new title, too! “Abide in Me” – Learning to find the rainbow in life’s storm clouds, will be a devotional focusing on the words of Jesus, and His miracles. In the writing, there will be deep healing for some hidden-away broken places in my heart, mind, and body. It’s already started, soft and subtle and easy to miss. Just like that rainbow. But just like the rainbow, it’s there. And like the rainbow, that feels very much another miracle! Has God ever surprised you by leading you in a totally unexpected direction? Or what rainbows are you seeing in your life right now? One comment made on this post before October 16 will be chosen at random to win an ebook copy of Lessons from Pollyanna. But I’m running way behind on stories I hoped to have written by now. 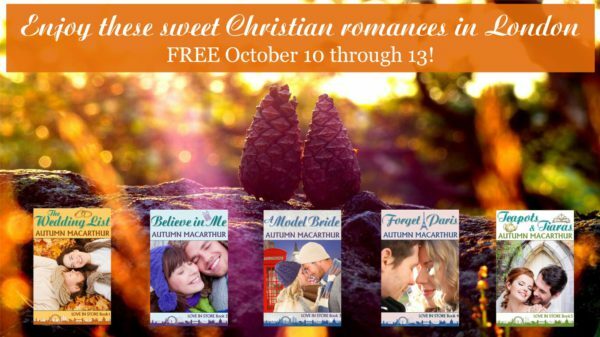 As an apology to my newsletter subscribers for not delivering yet on the free Love in Store novelette I promised them, I’m making all the ebooks in that series free this week. I want my friends here at Inspy Romance to know about it too! Book 1, the The Wedding List Is always free. Believe in Me, A Model Bride, Forget Paris, and Teapots & Tiaras will be free from Tuesday 10th through Friday 13th only! Books 2-5 are Amazon only, so if you get your books from a non-Amazon online bookstore, just let me know. Hi Autumn, glad to hear you have stories and words:) I love your analogy of the fallow field- what a powerful system God gave to the Israelites (and us in a weekly day of rest), and how beautiful to connect it to seasons in life. Thanks Autumn:) Love that subtle rainbow and the reminder of its promise! I’m glad you enjoyed the post, Wendy! God plans everything perfectly. Beautiful post, Autumn. I’m happy that once again the words are flowing. Often after a dry spell, some of our greatest accomplishments blossom. Thanks Jill! I hope that’s how it works! Busy day today, so plenty of ideas for my story are popping, but no story words yet. Hoping tomorrow! Hi Autumn! Life definitely has its challenges, especially when thrown a curve ball in a direction we didn’t expect – caring for family, career changes, moving,retirement, death of a loved one or friend. 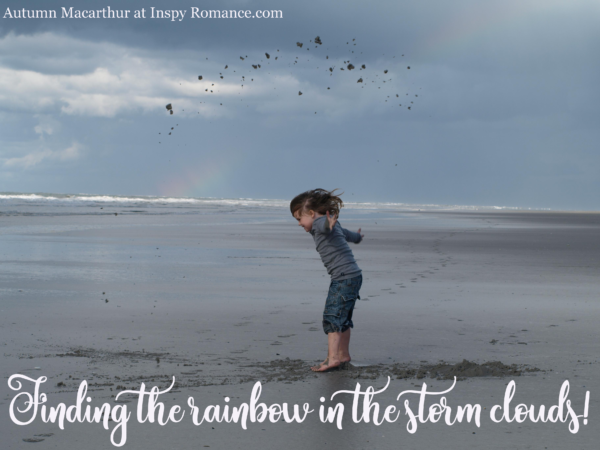 Rainbows – a wedding and birth of a child, plus more. Blessings as you find new words and thanks for an insightful blog. Thank you Renate! So true, life is always filled with unexpected challenges. And thankfully, unexpected blessings too. Thanks for the post! Dry seasons are hard… being led in a different direction harder… but He promises to be with us always. In August of ’77 I ripped my right knee apart (destroyed 3 of 4 ligaments), and still learning to see the blessing (*many*) that it brought me. Ouch! I’m glad you’re seeing the blessings, and praying many more blessings for you! Wow! This is a powerful and wonderful post! I’m so glad that I stopped by today to read it! When I read posts, I often end up singing a song, and this one reminds me of the song that says: “rejoice in the wilderness. God only wants to abide in you.” Wildernesses are hard to rejoice in. Loved, LOVED this post! It is so encouraging, and I’m sure that it will bless and encourage many – me included. Thanks for sharing! Thank you for YOUR gift of encouragement, Becky! I’m glad the post spoke to you. And I love that song line. So true. The way through any wilderness is keeping our focus on God. I’ve started a new devotional, and I know writing that will be an incredible experience. I learned so much and grew so much nearer God doing the last one. Not exactly story words yet, but ideas flowing fast for a new romance, too, so I’m hoping! Praying for you, Autumn! And trusting with you that God has His hand on this fallow time. He does, He always does. So glad I stopped long enough to read this message from you. Just what I needed to encourage me today I’ll try to be patient waiting for _Abide in Me_, but I am looking forward to your help to see the rainbows in the recent storm clouds we have been experiencing with our bipolar son. I am holding on to trusting that God has some purpose in all this for him and for us that we can’t see. Also I’m very excited that tomorrow I’ll be able to get the last book of the “Love in Store” series I hadn’t been able to order. Thank you SO much, Autumn! I hope you get time to read and enjoy Teapots & Tiaras. Anita is one of my favourite heroines. Thanks for sharing, Autumn. Praying for you and trusting that God is leading you! Beautiful post.. I always look forward to these posts. I love watching rainbows and when God answers prayers, I feel that He shows me rainbows. That’s a lovely thought, Andrea! When I see a rainbow, I always thank God for His faithfulness in keeping His promises! Thank you for your post Autumn. It was inspiring! Love all your books. Cant make up my mind if my favorite one is Forget Paris or Teapots and Tiaras.. probably Forget Paris. Anyway, it´s always inspiring to read your words — romance novels or blog posts. Thanks for your hard work. Sorry life is hectic right now. One unexpected road He took us on almost two years ago is when my husband switched jobs when he wasn’t even looking to. We look back on that now and realize it was perfect timing in every way. So many positive things have happened since then that it’s hard to list all the blessings that’s come from the change :-) All I got to say is: God is good!! Praying you will have peace and rest and know God is working even when it seems you’re in the middle of the desert! Thank you for your prayers, Trixi. I’ve been feeling both better in myself and a lot more clarity since Monday – so I’m sure the prayers are helping. So sorry I missed this post, Autumn! What an amazing, profound post! I’ll keep praying for you. And so kind of you to make all your books in Love In Store series free. I love your books! That was an unexpected and very last minute addition, late on Sunday night, not many hours before the post went live!